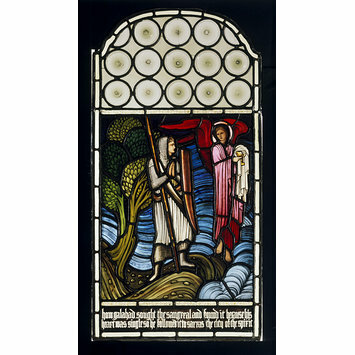 Given by Sir Philip Burne-Jones, Bart. Panel. 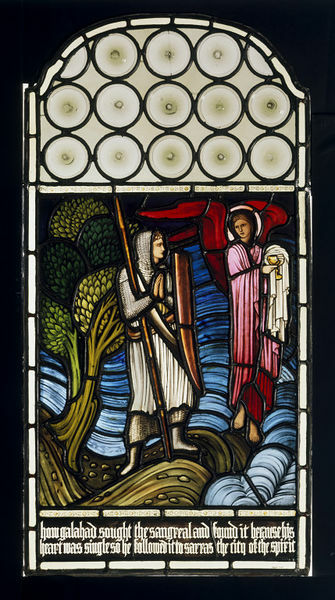 Galahad with spear and shield standing on a promontory, his hands raised in prayer whilst the angel with the grail appears before him. Below, an inscription:"HOW GALAHAD SOUGHT THE SANGREAL AND FOUND IT BECAUSE HIS HEART WAS SINGLE SO HE FOLLOWED IT TO SARRAS THE CITY OF THE SPIRIT". Mainly blue, red, green and yellow. Outlines in grisaille. "HOW GALAHAD SOUGHT THE SANGREAL AND FOUND IT BECAUSE HIS / HEART WAS SINGLE SO HE FOLLOWED IT TO SARRAS THE CITY OF THE SPIRIT"
Absalon, Patrick, et al Le Roi Arthur. Une légende en devenir . Paris: Les Champs Libres, 2008. 51 p., ill. ISBN 9782757202159. Conrad, Christopher, 'The Quest of the Sangreal and Religious Themes' in Edward Burne-Jones: The Earthly ParadiseStaatsgalerie Stuttgart & Kunstmuseum, Bern. 157-177. ill.